We have adult dance classes in the evening, on the weekend, and in the morning; these Seattle dance classes are open anyone 18 and over. With this flexible schedule, you can surely fit a class in! Even if you work, attend online universities or have a family to take care of, there is bound to be one morning, evening or weekend class you can make it to! You’ll have a blast. Come on down, bring your friends if you feel like! 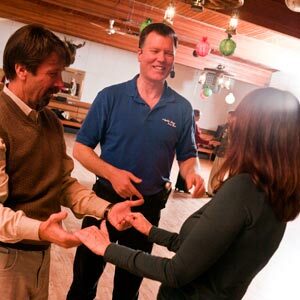 We offer classes in a variety of styles—from traditional Seattle waltz lessons to more casual Seattle line dance classes. Our group-style Renton dance classes run in 6-week series (depending on holidays). You can also drop-in to any of our Renton dance classes during first or second week—please check with us to make sure it is appropriate to drop-in on a class. These classes run the gamut, from Seattle ballroom dance instructions to Seattle tango dance lessons and everything in-between. e. or just can’t fit our group classes into their busy schedule. For more information on all of our Seattle dance lessons that cater to communities throughout the Puget Sound area, visit our blog. Are you new to The Rockin’ Horse Dance Barn? Here are some of the Frequently Asked Questions FAQ. Beginning Level = (1a) & (1b) You may take either (1a) and/or (1b) your first time or in any order. They are both Beginning Level. They each cover different material to complete your knowledge for that dance style. • For Swing classes we recommend you start with East Coast Swing or Jitterbug before taking West Coast Swing. This is based on many years and many students’ experiences in Swing dancing. • All level 2 & 3 dance classes require completion of and competence with Beginning level dance classes’ material. Repeating dance classes to obtain confidence is encouraged. • Dance Partners are not required. We recommend having a partner so you can practice. However we realize that is not always possible. Pre-registering for a class will help us make sure the classes are balanced with Leads and Follows. Join others and learn fun, easy line dances or just come for the great exercise. This class is for adults of all ages and abilities. No experience required. This class is for all of you experienced line dancers looking to challenge yourselves. Learn more intricate dances with lots more turns and more to memorize with Tags and Re-starts. This class is for the very experienced line dancers. Learn new, more intricate dances with Tags, Bridges, Choruses, Re-starts and a, b, c parts. If you are looking for Adult Ballroom Dance Classes or Adult Night and Weekend Country Dance Classes The Rockin’ Horse Dance Barn is the answer, We also offer Morning Line Dance Classes, Evening Latin Dance Classes, Night Swing Dance Classes including Social Dance Lessons. We will help you Learn to Dance, and we hope you have fun while you Learn Dancing or Learn to Dance for Fun.